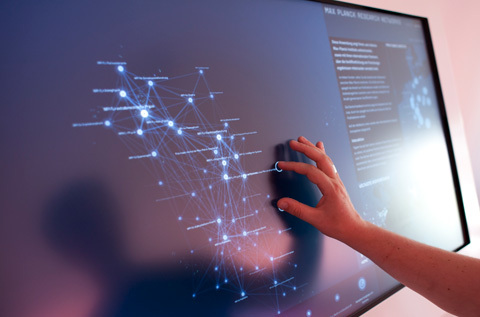 The multi-touch installation Max Planck Research Networks reveals how Max Planck Institutes collaborate with each other, and with their international partners. The piece is exhibited at the Max Planck Science Gallery, a highly interactive exhibition space presenting new forms of science communication in Berlin. You should come and visit it. Big thanks also to my colleagues at Elsevier and Max Planck Gesellschaft, who made the collaboration a real pleasure. I was also quite impressed with the overall project direction of Archimedes, who did a fabulous job of conceiving and realizing the exhibition space.